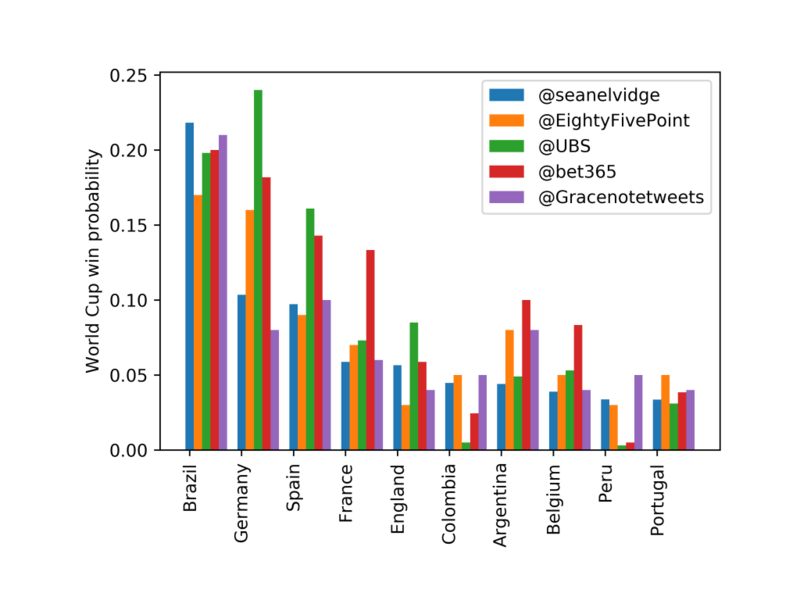 My model, like a lot of others, is based on the World Football Elo ratings (WFER). Which is a system that uses the Elo rating system. You can read all about Elo on those two links, but basically after every game a team gains or loses points. The change in points is dependent on the two rankings of the teams. If there is a large difference between the two teams and the lower ranking team wins then they would gain a lot more points than if the higher ranking team won (since it is expected that they should win). The WFER site takes into account all games that results could be found for (so goes all the way back to the first official International football game, between Scotland and England on 30 November 1872, 0-0). My model uses a combination of ensemble machine learning methods for classification problems, random decision forests. Each decision tree in the ensemble is taken from a bootstrap sample of some training set where observations about an item (represented in the branches) can be used to drawn conclusions about the item’s target value (represented in the leaves). It is a standard technique which has a wide range of uses, including the evaluation of Wikipedia articles quality and importance. Fixtures from the World Cup, European Championships, Africa Cup of Nations and Copa America. The final results are then an average of the output of each of the three trained models. To test the success of the model part of the data (15% in this case) is held back and then compared against. After training the model, the accuracy of the model predictions are compared to the held back data. 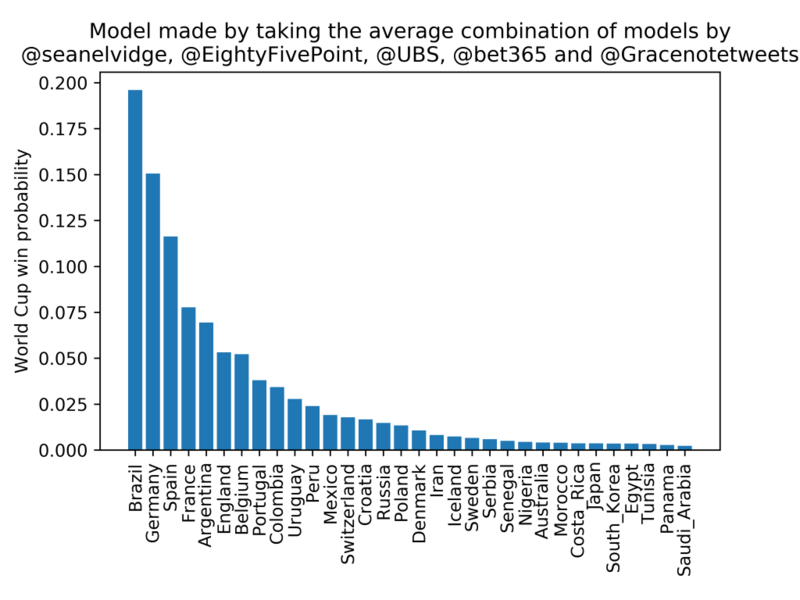 In this case the model was shown to be 94.8% accurate in predicting a win, draw or loss. 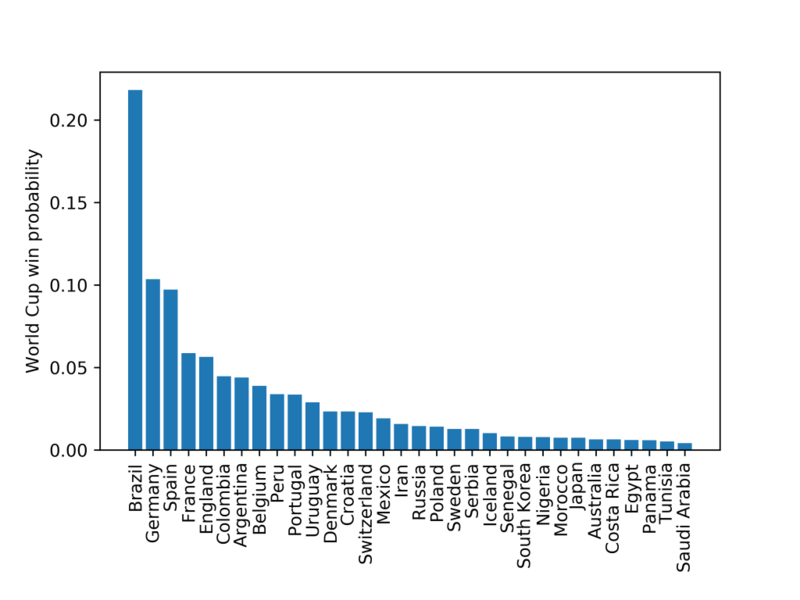 You can see the model predicts that Brazil have by far the greatest chance of winning the World Cup, over twice as much as the next most likely team, Germany. Which gives Brazil a 19.6% chance, followed by Germany (15.0%) and Spain (11.6%; although this doesn’t take into account that they sacked their manager 2 days before their first game of the tournament! ).